Editor's note: This story is part of a series examining the views of military service members ahead of the presidential election. Most American military personnel are deeply skeptical of the United States' nation-building missions overseas and would prefer to see leaders in Washington focus the country's resources on less ambiguous missions like killing terrorists and protecting the homeland, according to a new first-of-its-kind survey. 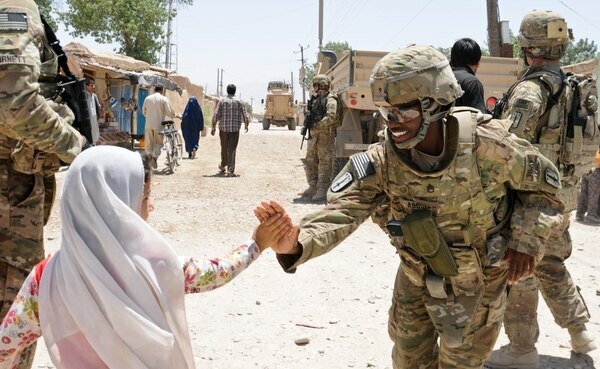 The poll of more than 2,200 active-duty troops, a collaboration between Military Times and Syracuse University's Institute for Veterans and Military Families, gauged service members' opinions on U.S. foreign policy priorities. It was conducted in early September. 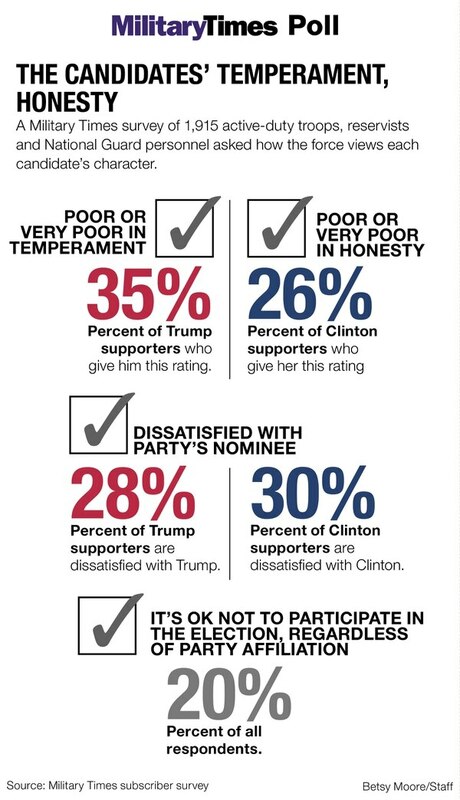 Other questions assessed service members' political views as the nation prepares to elect a new president. One survey question asked: "How do you view the U.S. government’s continued involvement in nation-building efforts, establishing democracies in the Middle East and North Africa using U.S. military and financial support?" About 55 percent of respondents said they "strongly oppose" or "somewhat oppose" those efforts while 23 percent expressed support for such missions. The remainder expressed no opinion on the issue. Such views highlight the concerns likely to shape service members' voting patterns come November, and they underscore the extent to which many military professionals are uncomfortable with key polices advanced by Barack Obama and his predecessor, George W. Bush, as part of America's efforts to combat global terrorism. Both presidents leaned heavily on the military while pursuing varied degrees of nation building, notably in Afghanistan and Iraq. Their success in those endeavors remains questionable at best. The security situation in both countries is exceedingly fragile today — after 15 years of war, trillions of dollars spent, and thousands upon thousands of casualties. "There is a healthy skepticism of nation building among most service members I’ve talked to. It’s born of experience. And the biggest source of the objection is the idea that we might intervene when local support might not exist, or local conditions might not be favorable, or the military tool is not the best tool for the task," said Phil Carter, director of the Military, Veterans and Society Program at the Center for a New American Security. He's a former Army officer and Iraq war veteran. "What you are seeing is a lot of caution and deliberation among those who would carry the burden of future interventions or future involvements." Most of the service members surveyed by Military Times and IVMF said they believe the United States' national security strategy should focus less on distributing foreign aid, conducting "stability operations" and participating in conventional military missions overseas. Instead, troops believe that the nation should be more engaged in direct counter-terrorism activities (62 percent), homeland defense (68 percent), cyber security (81 percent) and nuclear deterrence (51 percent). It's a nod to the range of threats facing the U,S. today, concerns that reach far beyond the high-profile military missions in the Middle East. Russia is resurgent. China is more assertive. Iran is an dangerous troublemaker. North Korea is unpredictable. And attacks on American computer networks are becoming much more aggressive and pervasive. Carter, the military analyst, said it appears America's service members are sending a message to those running the country and making the decisions to send young men and women into harm's way. "There’s a healthy civil-military tension about what missions the military is willing to do," he said after reviewing the survey results. "I think what the military wants to register is that these wars are messy, and in some cases very bloody, and they ought not be considered lightly." The issue of foreign aid drew the most starkly negative response from troops. About 62 percent said they believe the United States should be less involved with assisting other countries, compared to just 10 percent who said the U.S. ought to get more involved globally. One in four said the current balance works just fine. During the past several decades, traditional U.S. foreign aid has accounted for less than 1 percent of all government spending. And the vast majority goes to just two countries: Israel and Egypt. Many survey respondents also said they oppose military involvement in stability operations, with 51 percent indicating the U.S. should do less of that — and only 19 percent saying they believe more is required. The Army in 2008 defined stability operationsas a "road map from conflict to peace" in volatile parts of the world where governments either don't exist or the rule of law is inadequate to provide basic services for the civilian population. "America’s future abroad is unlikely to resemble Afghanistan or Iraq, where we grapple with the burden of nation building under fire," Lt. Gen. William Caldwell predicted in his forward to the 200-page manual. "Instead, we will work through and with the community of nations to defeat insurgency, assist fragile states, and provide vital humanitarian aid to the suffering." The military, in particular special operations forces, has pursued stability operations on a smaller scale beyond Iraq and Afghanistan. Troops have supported local militaries fighting drug lords in Colombia, Islamic separatists in the Philippines and groups linked to al Qaida across the Middle East and Africa. Some troops believe that Washington’s foreign policy focuses on other countries’ needs at the expense of the United States’ own economic and environmental interests. "We need to get out of foreign affairs and focus on our own country," said Duane Hulbert, a 26-year-old Air Force staff sergeant, who responded to the survey. "We need to build jobs around clean, renewable energy sources. We need to leave coal and oil behind. It’s time to focus on how to protect this one world we live on. If we destroy it there is no going back." Other troops are disillusioned with nation-building efforts because they feel that America's nonmilitary support for those same goals are not used properly. "It is not just about being involved in nation building and security but also how it is done. We have a lot of assets throughout the federal government that should be levied and we are not," said one Marine Corps major who responded to the survey and asked not to be identified, concerned that doing so may be viewed as politicking in uniform, which is forbidden under military policy. Those who responded to the Military Times-IVMF survey were evenly split on the issue of political and cultural diplomacy. About 38 percent said involvement in those issues should remain the same, 28 percent said the country should focus more on outreach, and another 28 percent believe that focus should be less. Similarly, there is modest support for well-defined humanitarian operations. When natural disasters strike overseas, it's often American troops and aircraft who are mobilized to help, and it would appear that remains a source of pride. To some degree, the military's views are cyclical. After the Vietnam War, for instance, many troops were disillusioned with overseas intervention. Yet after the Cold War, many troops were supportive of the relatively low-risk and apparently successful nation-building efforts in the Balkans. Since 2001, the wars in the Middle East have shaped the views of today’s force. "To this generation, nation building has a connotation with Iraq and Afghanistan, and the difficult counter insurgency mission there. That link is inescapable," Carter said. "Very few people who’ve served in the wars of the last 15 years think it’s viable to plant democracy with a rifle." Between Sept. 8 and 15, Military Times and IVMF conducted a voluntary, confidential online survey of U.S. service members. The questions focused on the nation's current political climate, the 2016 presidential election and other relevant issues. The survey received 2,207 responses from active-duty troops. A standard methodology was used by IVMF analysts to estimate the weights for each individual observation of the survey sample. The margin of error for the presidential preference question is 2 percent. Other questions have slightly higher margins of error. The survey audience was 85 percent male and 15 percent female, and had a mean age of 29 years old. The respondents identified themselves as 73 percent white, 16 percent Hispanic, 8 percent African American, 4 percent Asian and 8 percent other ethnicities. Respondents were able to select more than one race. Responses came from each of the 50 states, the District of Columbia and unspecified sites overseas. Tilghman is Military Times' Pentagon bureau chief. Senior Reporter George R. Altman contributed to this report.